An American household spends, on average, $1,700 per year replacing last year’s clothes. Where do all of the unwanted clothes go? Some get donated to charities like Goodwill Industries for further distribution. Others get dropped in the recycling bin, where most consumers assume they will end up in a recycling center, where the fabric will be broken down and absorbed back into raw material production. All is well, right? Not quite. 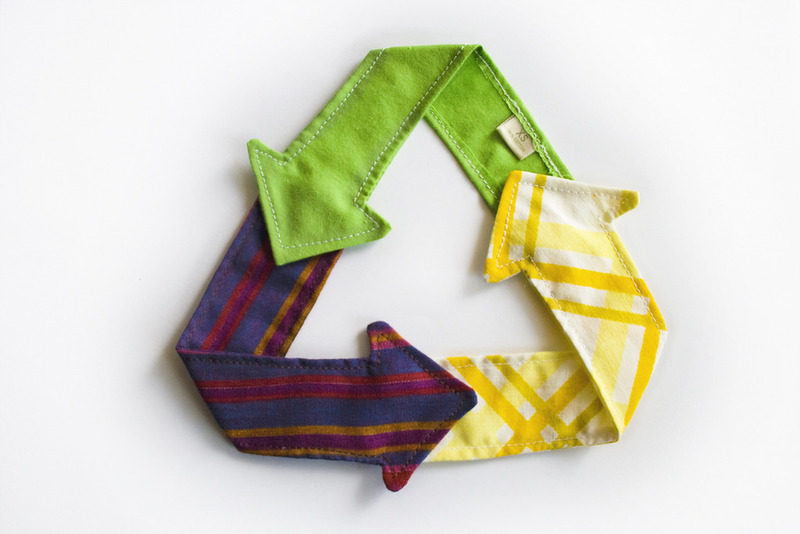 According to a 2013 Environmental Protection Agency report, only about 15% of the 15 million tons of textiles that get discarded actually get recycled, while the rest is dumped in landfills or simply filters as litter into the environment. And the tonnage isn’t slowing down. Members of Western societies, especially the younger population, are incentivized to rapidly purchase and discard cheap clothes based on cyclical seasons and trends. This type of “fast fashion” (dubbed ultrafast fashion in the digital world) has become a cultural and generational phenomenon in which fashion retailers churn out massive amounts of cheap, disposable clothes through suppliers in developing countries in an effort to cater to capricious consumer demands in industrialized nations. Fast fashion has become a major source of pollution. The end-to-end production process of apparel requires large amounts of land, labor, chemicals, machinery, energy, and water, not to mention the packaging materials for distribution and sale. And the resource bill does not end at purchase: The majority of the energy consumption in the life cycle of a cotton shirt derives from post-purchase washing and drying. On the public health front, watchdog organizations have detected a wide range of persistent, bioaccumulative, and carcinogenic toxic chemicals in a variety of clothing, including children’s apparel, among suppliers and retailers around the world. Greenpeace also has linked serious river pollution in multiple developing countries to garment factory wastewater discharge. 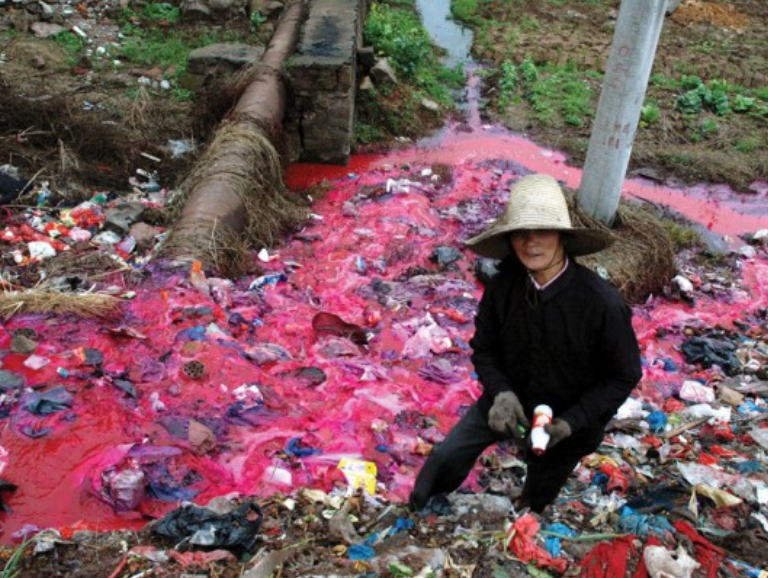 In China, there are over 400 “cancer villages,” where cancer occurs at an extraordinarily high rate due to industrial water pollution, including wastewater discharge from nearby textile factories. See source and more colored rivers here. Since the late 1900s, when the World Trade Organization started removing international quotas on textile imports, major American and European apparel retailers have expanded sourcing and manufacturing in low-wage countries to fuel the labor-intensive segments of apparel production, such as dyeing, sewing, and assembling. The lack of regulations in these developing countries not only drives down costs but also increases the speed and volume of production at the expense of these countries’ environmental health, public health, and workers’ rights. In Bangladesh, for example, where about 5,000 readymade garment factories generate 80% of the country’s exports to the West, the labor rate is $0.31 per hour. In such developing economies, the demand for jobs is just as dire as the retailers’ desire to cut costs, driving the damaging cycle to new lows. Almost 80% of the 3.6 million workers in Bangladesh are illiterate women who lack the knowledge, resources, or power to organize themselves and voice their workers’ rights before a government composed of factory owners or their associates. Without understanding the environmental impact of their actions, many also are used to the practice of releasing untreated industry discharge directly into nearby rivers. Even after catastrophic events like the collapse of the Rana Plaza garment factory in 2013, which killed 1,136 people, suppliers in developing nations have little bargaining power to negotiate better working conditions because they are competing against suppliers in other low-income nations. It’s the proverbial race to the bottom, all in the name of next season’s new blouse. Of course, fast fashion delivers certain benefits for the end consumer. The main benefit is a seemingly inexhaustible myriad of cheap fashion items. Meanwhile, in the developing countries where these items are produced, fast fashion incurs real consequences. Is the tradeoff worth it? It’s a question that has not been asked or considered widely enough. What’s certain is that fast fashion is an unsustainable business model destined to exhaust its fuel. Over the past several years, a variety of initiatives have emerged to reverse the pace of fashion, from take-back programs to launching of high-end brands based on local or sustainable supply chain. Rental platforms have also become popular, in which consumers pay a fixed monthly fee to ship back and forth an unlimited number of clothes to try on various occasions. While facilitating trade and rental of clothes accelerates the pace and volume of demand, it also allows significant cost savings for the end consumer as well as easy dissemination of higher quality clothes that will not get tossed so fast. The U.S. government and global nonprofits have also set more industry standards. For example, the International Working Group on Global Organic Textile Standard offers accreditation to approve independent agents and organizations to audit and certify retailers and suppliers before they can label their products organic. Yet compliance with such standards remains voluntary and largely unpursued, as it’s dependent on the retailers’ willingness, not to mention debilitatingly low enforcement capacity, to actually monitor and enforce it. Thus, when setting their supply chain’s code of conduct, retailers should foster a culture of transparency in which they encourage suppliers to report incidents and then work together, lending knowledge and resources, with those suppliers to fill whatever gaps in standards. Retailers may even partner with nonprofits in supplying countries in this effort, as Walmart has done with the Institute of Public and Environmental Affairs in China. Only through such collaboration can retailers help suppliers to independently develop their own infrastructure for recognizing problems and improving their standards, creating a sustainable supplier network. At the level of individual consumers, incentives to develop and uphold standards for an ethical supply chain will need to directly reflect consumer demand for such a practice. As the end consumers in an industrialized nation who drive demand, Americans undoubtedly have the ability to leverage their purchasing power. Thus, it is important for American consumers to remind themselves that when they lift an on-sale pair of jeans from the rack, they are taking on a moral responsibility to foremost understand, and then base their purchasing decisions on, who else may be bearing the additional cost they are not willing to pay. Check out some of the efforts at arousing a societal conscience for transparent supply chain, such as the Sustainable Apparel Coalition’s Higg Index, Patagonia’s Footprint Chronicles, and the retail giant Walmart’s Sustainability Index supplier scorecard program developed in collaboration with the The Sustainability Consortium. See additional resources below to learn more.